BEGINNER CLASSES ENROLLING NOW! KIDS MARTIAL ARTS IN BRONX TEACHES SELF CONFIDENCE & DISCIPLINE! TCK Mixed Martial Arts' kids classes are designed to impart valuable life skills to our students from self-defense and stranger danger, to confidence and goal-setting. The primary focus of our kids martial arts program is to develop fundamental techniques, and create a solid foundation to build upon as they grow. 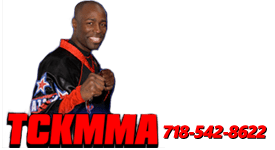 TCK Mixed Martial Arts' curriculum, which is a blend of various martial arts, is designed to give you the best and most complete instruction possible. Each discipline contributes a unique aspect to your training, making you a well rounded martial artist. Our great After School Program offers the convenience of free transportation from your child's school to TCK Mixed Martial Arts' studio - a safe and fun environment. Great facility with one of the best martial arts instructors on the planet. @Jadi tention is one of the few Sensei's out there i completely trust to help anyone bring their game to the next level. whether you are a beginner, or have been in this for years. Dont Wait go there now! A great place to learn from one of the greatest fighters ever in my opinion. A school and learning environment that will help sharpen your skills and give you an opportunity to look inside you to be the best you can be! Years ago at Champion Karate in Gathersburg MD took a seminar from Sensei Jadi Tention. Years later I am having Sensei Tention teach a seminar at my school Champion Karate West in Provo Utah on August 08, 2014.